Homemade sauerkraut has become a staple for us around here, particularly during the winter when there’s not much in the way of fresh produce. 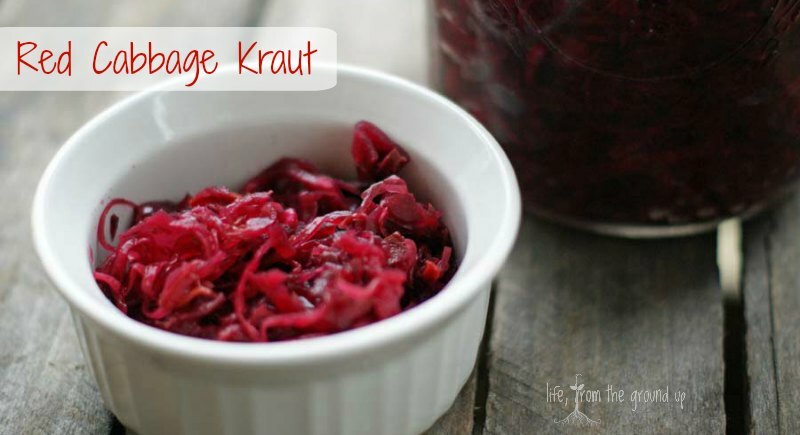 We’ve made a more traditional sauerkraut on numerous occasions in the past, but since kraut is infinitely customizable, I wanted to make something a little more colorful… enter this easy red cabbage sauerkraut. Okay, it’s not exactly a culinary breakthrough, but it’s pretty and delicious, and with some added beets and carrots, makes for a really nice addition to any sandwich or burger, or just a simple side. Plus, you get the benefits of all those phytonutrients that tag along with dark vegetables. Fermenting the cabbage adds gut-healthy probiotics, improves the digestibility of the vegetables, and actually increases the amounts of many vitamins, particularly B and C, all of which makes for a nice immune system boost. And it’s traditionally eaten during the cold months, which is cold and flu season… whether it’s coincidence or some kind of innate knowledge, our ancestors surely knew how to eat to match the calendar. So, let’s get started. I won’t even make you use a fancy crock (though you’re certainly welcome to). 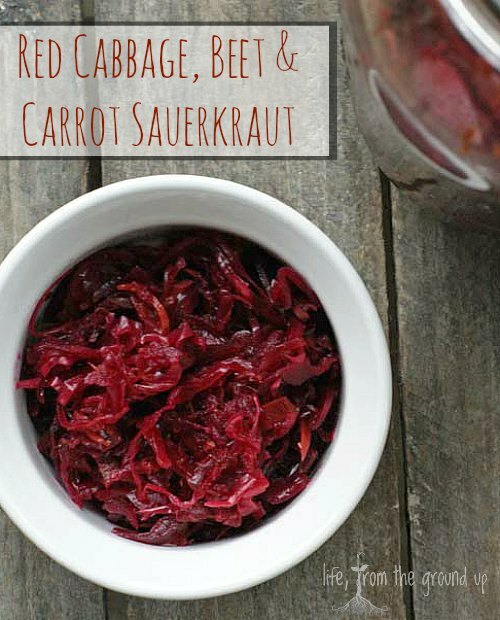 For this red cabbage sauerkraut recipe, you’ll need a head of red cabbage (obviously), a bunch of beets, and a few carrots, but you can add/remove vegetables based on your personal preference. Shred the vegetables. My trusty mandoline is great for this, but you could go all out with a traditional cabbage shredder too. Or a knife. Whatever works. Put everything into a bowl, then add pickling or sea salt (not iodized). A basic rule of thumb is roughly 1 Tbsp salt for every three pounds of vegetables. Some of my earlier krauts ended up way too salty until I actually started measuring the salt and weight. Using your hands, stir it, knead it, squeeze it – just get really physical with your cabbage for a minute. Let it sit for an hour or so. When you come back, it should be wilty and juicy. Dump all of this into a large jar (or crock) – I use half-gallon canning jars to great effect here. Press the vegetables down hard. You want them to be fully submerged in the liquid. If there’s not enough juice to cover it, let the jars sit for another eight hours. If there still isn’t enough, you can top it off with a little water (not too much though – if you need to add a significant amount of water, make sure you put salt in the water too, otherwise the brine will be too diluted and may spoil the whole process). Let your jar sit in a coolish (somewhere around 60-70 F) area for at least a week (lightly covered, to keep the bugs out). In the winter around here, it’s perfectly fine on the kitchen counter, but if you’re in a warmer area, maybe a basement would work better. Some of the cabbage will want to rise to the surface and float, so you can either fill a smaller (jelly-size) jar with water and put this on top to keep things submerged, or just make sure you press it all down at least a couple times a day. After a week, start tasting it until you’re happy with the flavor, then put it in the fridge. This will slow, but not stop, the fermentation process. It should keep for many months, or until you finish it. Use your red cabbage sauerkraut as a garnish for all kinds of food (I love a bit with my eggs in the morning), or just grab a forkful when you walk by! Shred the vegetables using a mandoline or sharp knife. Put the vegetables into a large bowl, and top with salt (about 1 Tbsp for every three pounds of veggies). Mix it well with your hands, then let it sit for an hour. Dump the mix into a large jar or crock, making sure that everything is fully submerged beneath the brine (you can add some water as needed, but if you're adding a lot, make sure you also add some more salt). Let the jar sit in a cool spot (a kitchen counter during the winter is fine) for at least several days. Press the cabbage down a few times a day to keep it submerged. After a week or so, start to taste. If you want more tang, let it sit another day and try again. When it suits your taste, put it in the fridge, where it should keep for months. I’m wondering if anyone has tried this recipe with dill added? I tasted, and bought, a similar sour kraut recipe with dill and I liked it very much. I’d like to try to make some for my own use but I’m not sure how much dill to add. Any thoughts? Dill would be an excellent addition! I would just start with about a tablespoon for the first try…and adjust from there on the next batch….I am going to use caraway seeds when I make a batch tomorrow.